Parking (in a garage across the street from the venue) was $13 for the day, which is not bad by Chicago standards, but pricier than many other feiseanna, and at that amount, is something that needs to be built into the budget for the day. There was a bit of a walk (through skywalks) from the parking lot to the feis location, but once we arrived, registration was right inside, and my dancer was checked in quickly and easily. The convention center space allocated to the feis was generous. There was plenty of room for camping, practicing, etc. Since this was a VERY large feis (I believe around 1,200 dancers), and my dancer is fairly young, we were happy to find a spot away from all the noise & chaos so we could have some down time between dances. The feis had 8 stages this year, and all were used for grades dances. The stages were set up with 4 on each side of one end of the space. The stages were close together, with curtained partitions separating them. My dancer’s stage saw several slips & falls, which leads me to believe that the plywood on that one might need to be replaced. I did not notice any attempts to mop or otherwise fix the issues, which was unfortunate. Restrooms were plentiful & relatively clean. I never had to wait in line in the ladies room, which was nice. Toilet paper & paper towels were in stock all day. My dancer danced 5 times & was seen by 4 judges. That is excellent rotation, in my opinion. I do wish more comments had been left, though, as my dancer received only 1, and was left wondering why her placements in a couple of dances were significantly lower than usual. As I said before, I could not hear the music well from the audience, but my dancer could hear fine. I heard no complaints about any of the musicians, and the one on my dancer’s stage seemed enthusiastic and happy to be there. The feis had a concession stand with pizza, chips & other similar items. There was not much variety or much of anything healthy, and prices were, in my young dancer’s words “a rip off”. A small bottle of water was $3.50, and prices only went up from there. However, there was no ban on outside food (although no coolers were allowed) at this feis, so those who prefer to bring their own food can do that. This is where this feis went south, in my opinion. We waited almost 45 minutes for the results from my dancer’s last competition. We wait until my dancer has completed all her dances to check results, so I don’t know if that was a fluke or the norm, but I did notice that many competitions were posted out of order, so it did seem like there was some trouble overall in this area. Additionally, placements were very limited. It appeared that only about 25% of the dancers in a competition were placed. While I don’t believe every child needs to come away from every feis with an award, I do think that placing only 25% of the kids at such a large feis (and one that is close to the Oireachtas & therefore has a lot of VERY strong competition) is pretty stingy. Medals were awarded for all grades placements, and large trophies were given out for 1st place in Open Prizewinner. Both medals & trophies were very nice quality. For grades, this feis was run by dance. Most stages were single age groups, but a few had 2 ages. Because there are more grades dancers in the U9-U11 age groups than in others, this meant that dancers were not evenly distributed across the stages & some stages finished much earlier than others. 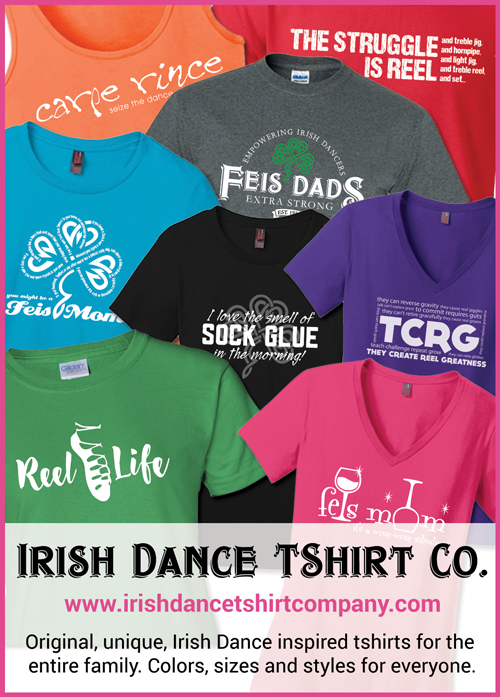 Additionally, due to its proximity to the Oireachtas, this feis attracts many ceili entries. Several stages had to be held in the morning because dancers were dancing ceilis on other stages, so many dances were delayed immediately, which was unfortunate. The feis organizers did move dances off the slower stages & on to open stages as the day progressed, but dancers in the large age groups definitely had a VERY long day. My dancer started dancing around 9:30 and was not finished until nearly 4:00. The lunch break was well communicated & dancing started up again promptly after 30 minutes, but not all stages took a lunch break at the same time, which was confusing & made it difficult for anyone with multiple dancers to eat lunch. There was also an issue with one of the treble reels, which was to be held as the last dance on one of the stages, but was instead delayed for 3 hours while dancers on other stages finished. Had all lunch breaks been taken at the same time, the Treble Reel could have been held at lunch, and dancers who were done soon after would not have had to sit around and wait for so long. Not bad overall. We are not likely to return next year, as the long day was too much for my young dancer, but I would be willing to try this one again when she is older. Although my kids are used to getting a ton of medals at other feisanna, the ones from Pat Roche and MHG’s feisanna mean so much more to them simply because they know that they really had to earn a medal to take one home.